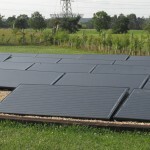 Good Property Services Ltd are experienced in the design, supply and installation of Ground Mount Solar Panel installations, which provide an ideal solution for those looking for a land, rather than roof based solar photovoltaic array. Ground Mount solutions offer greater flexibility in that they can vary in design and size in order to suit the level of energy they are required to serve, the space available and the use of the land immediately adjacent to the installation. This 2015 installation was carried out for a homeowner near Wimborne in Dorset. The owner had recently acquired further land adjacent to his property and decided to take advantage of this additional land to host an energy generating source for his property. GPS incorporated railway sleepers into the design in order to provide a rugged frame surround for the array and dense gravel for its base. 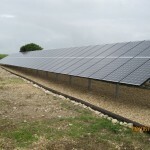 The solar panels are chosen for their quality and suitability for this type of installation – as well as the ability to generate a superior level of energy during daylight hours. These panels are mounted on purpose built pods which ensure the correct elevation to maximise the capture of energy generating UV rays. Each pod was laid with the added challenge of an undulating landscape. GPS mounted individual micro-inverters, known as Enphase to each of the panels. 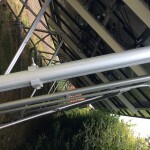 This is in place of the more traditional single inverter which is connected to the panels via what is known as a string installation. Enphase is GPS inverter of choice as it enables each panel to function independently of each other; ensuring issues such as shading do not compromise the entire array. Enphase also enables a greater level of energy production, up to 35% and when purchased through GPS comes with an impressive 25 year warranty. GPS also choose Enphase because it enables the customer and GPS to monitor the system 24/7, with an alert received if there is ever an issue with a system – albeit a rare occurrence. Our latest project is a 40 solar panel ground mount installation at the stunning Quarr Abbey on the Isle of Wight. The array is designed to serve the busy restaurant and is discreetly located just beyond the trees. GPS installed the panels on a rigid aluminium angled framework which creates a solid platform yet taking up little space which enables crops for the kitchen to be grown right up to the panels – even allowing for a space to walk around the panel system. An Enphase inverter system has again been installed on each panel which is specifically designed for outdoor use. 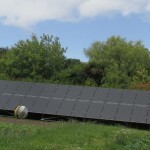 Between the 24th April and the 25th July the system has generated 4250 kW hours – with the highest recorded day 69.3 kW.